Fun Halloween ideas for one and all are found here! Halloween is one of our favorite holidays. We enjoyed the weeks leading up to the actual trick or treating as we planned for costumes, candy and parties! So what’s in this section? Halloween costume ideas for groups and couples.. all from the family archives. Halloween party and Halloween game ideas.. scary scavenger hunts, a Face your Fears party, plus two free games.. Boo Bingo and Spread the Spirit GHOSTING activity.. just print and play! Easy Halloween craft and Halloween decorating ideas are here too! Take a look below and choose what you need to CELEBRATE HALLOWEEN! Fun Halloween Ideas for Young and Old! Fun Halloween Costume Ideas for Groups All kinds of homemade Halloween costumes.. from kindergarten through college.. you are never too old to dress up in a Halloween costume, so take a look at some great ones here. Easy DIY Halloween costumes here... raid the attic, the basement, Grandma's closets and put together some great costumes! A Funny Halloween Costume Idea Take a look at this funny Halloween costume idea from many years ago.. but it will still work today, especially timely after last years summer Olympic games in London! Easy fall craft.. make a lantern from a mason jar! Make a fall pumpkin out of mason jar lids. Decorating Pumpkins.. easy, adorable and no carving needed These are the cutest Halloween decorations ever! See how you can decorate pumpkins without carving! These pumpkin poke ins are the cutest halloween decoration ever.. and there is an assortment to choose from at inexpensive prices! Fun Halloween Ideas for decorating pumpkins! Make your own Pumpkin Patch with these adorable little pumpkins that you have decorated yourself.. So cute for as favors for a fall bridal shower! See our 3 favorite outdoor Halloween decorations!! A Pumpkin Patch Party for Wee Ones We took one of the kids favorite birthday party ideas and themed it for Halloween.. Make sure you ask the adult helpers to come in costume too! A Scary Halloween Party Idea Look at this great Halloween party for "tweens".... the perfect age for all the great Halloween party games we planned. A Haunted Halloween Scavenger Hunt.. for ages 7 and up This Haunted Hunt is great fun.. sample clues are included..the kids all loved it! A Mega-Halloween Party Idea This was one of our family's most favorite memories... this Halloween party was anticipated by all the kids, their friends and even all us parents as soon as October rolled around.. See how we did it! Halloween Party Game Ideas from our Celebration Suggestions community. These fun Halloween ideas came courtesy of very creative members! There are some really fun game and decoration ideas.. new ones we had not ever heard of yet.. so thanks to our site community for sharing. Halloween Party Games - Great for classroom parties We designed this free printable Halloween Bingo game that is perfect for class parties too. Just print and play! A Fun Halloween Activity .. Spread the spirit with Ghosting An easy Halloween craft idea with a free printable Halloween Ghosting poster. Just add the candy! See how we incorporated this idea into a Halloween College Care Package! 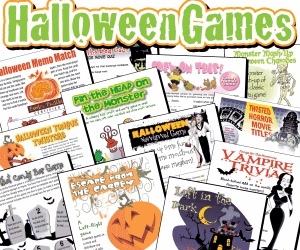 We always keep an assortment of these printable games on hand in the event that trick or treating is cut short by rain or we need to keep an active group of kids settled down while they are eating.. The assortment below has something for everyone!